Definition at line 88 of file RegionPass.h. Definition at line 31 of file RegionPass.cpp. Definition at line 169 of file RegionPass.cpp. 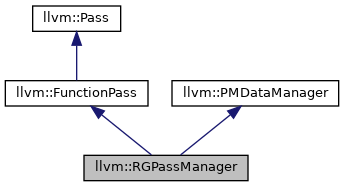 References B, llvm::RegionBase< Tr >::blocks(), llvm::PMDataManager::dumpLastUses(), llvm::Pass::dumpPassStructure(), llvm::errs(), getAnalysisUsage(), getContainedPass(), llvm::PMDataManager::getNumContainedPasses(), getPassName(), ID, llvm::raw_ostream::indent(), P, and llvm::AnalysisUsage::setPreservesAll(). Definition at line 47 of file RegionPass.cpp. Definition at line 111 of file RegionPass.h. Definition at line 110 of file RegionPass.h. Definition at line 117 of file RegionPass.h. Referenced by dumpPassStructure(), and runOnFunction(). Definition at line 123 of file RegionPass.h. Definition at line 108 of file RegionPass.h. Referenced by dumpPassStructure(), and llvm::RegionPass::skipRegion(). True if any of the passes modifies the function. Definition at line 54 of file RegionPass.cpp. References llvm::PMTopLevelManager::activeStack, addRegionIntoQueue(), llvm::RegionInfoBase< Tr >::clearNodeCache(), llvm::dbgs(), llvm::RegionPass::doFinalization(), llvm::RegionPass::doInitialization(), llvm::RegionInfoBase< Tr >::dump(), llvm::PMDataManager::dumpPassInfo(), llvm::PMDataManager::dumpPreservedSet(), llvm::PMDataManager::dumpRequiredSet(), llvm::EXECUTION_MSG, llvm::PMDataManager::freePass(), getContainedPass(), llvm::RegionBase< Tr >::getEntry(), llvm::Value::getName(), llvm::RegionBase< Tr >::getNameStr(), llvm::PMDataManager::getNumContainedPasses(), llvm::getPassTimer(), llvm::RegionInfoBase< Tr >::getTopLevelRegion(), llvm::PMDataManager::initializeAnalysisImpl(), llvm::PMDataManager::isPassDebuggingExecutionsOrMore(), LLVM_DEBUG, llvm::MODIFICATION_MSG, llvm::ON_REGION_MSG, P, llvm::PMDataManager::populateInheritedAnalysis(), llvm::PMDataManager::recordAvailableAnalysis(), llvm::PMDataManager::removeDeadPasses(), llvm::PMDataManager::removeNotPreservedAnalysis(), llvm::NVPTX::PTXCvtMode::RP, llvm::RegionPass::runOnRegion(), llvm::PMDataManager::TPM, llvm::PMDataManager::verifyPreservedAnalysis(), llvm::RegionBase< Tr >::verifyRegion(), and X. Definition at line 96 of file RegionPass.h.